The gang creates a huge mess after they get into a taffy-pulling contest. This Disneyland film completely encircled the audience, giving theme park visitors a 360-degree documentary auto tour of the western United States. Two Australian orphans stow away on a ship bound for England-and their only surviving relatives. Elmer is a dim-witted hunter whose "wooking for wabbits." 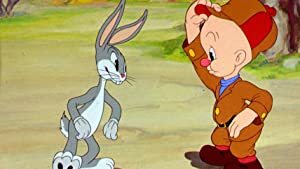 Bugs proceeds to confuse, bamboozle, and otherwise humiliate the poor simp.